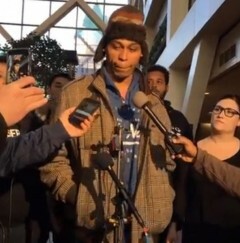 Racist found guilty for shooting #Justice4Jamar protesters | Fight Back! The first call came in to Cameron Clark – the jury would come back in 15 minutes, to say whether the man who shot him would be found guilty for his crimes. Through phone calls, texts and social media, Cameron and friends filled helped filled the courtroom, when Allen “Lance” Scarsella was brought in to face the jury. He was found guilty on all 12 counts against him, for his actions on Nov. 23, 2015, at the protest demanding justice for Jamar Clark, where Scarsella shot and wounded five Black protesters, including Jamar’s cousin Cameron. The guilty verdicts came as a relief to many who’d been watching the trial and expecting the worst. From the selection of a jury that was nearly all white and suburban, to the defense’s closing argument that Scarsella had acted in self-defense in the face of a crowd of loud, angry Black protesters, the outcome seemed rigged in favor of upholding the violence of white supremacy. Instead, the jury saw through Scarsella’s lies, laid bare in large part by evidence of his own deeply-seated racism. Dozens of Scarsella’s text messages were shown in court, full of disgusting racist slurs, combined with an obsession using guns to kill Black people. Also, the struggle for justice for Jamar Clark and other fights against police murders certainly helped this jury believe that Black lives do matter. Scarsella will remain in Hennepin County Jail until a sentencing hearing on March 10.